Teen Boys, Hitler Dogs and Evil Butterflies, Oh My! Season 4, Volume 1 of Adult Swim'sThe Venture Bros. is now out on DVD, and that means you can finally live out your discomforting boyhood fantasies of palling around with pedophilic bodyguards, Machiavellian monarchs and washed-up super-scientists—anytime you want! Season 4 follows Hank and Dean Venture as they continue to be menaced by their old nemesis The Monarch, form unhealthy bonds to a dog infused with Hitler's DNA and once again go head-to-head with The Guild of Calamitous Intent. Sounds just like your teenage years, right? 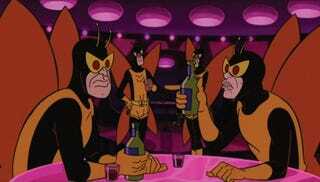 The Venture Bros. Season 4, Volume 1 DVD set features all 8 raw, raunchy and uncensored episodes from the first half of season 4, deleted scenes, commentary on every single episode, and a special Comic-Con promo. Season 4, Volume 1 of The Venture Bros. is out on DVD now, head here to purchase your copy!